This article has been updated lately on June 11, 2009. Since there is no any official Nepali language version of Facebook from Facebook Team, this article aims to provide desire for many Nepalese Facebook lovers a try. I think this post will also answer those who were looking for How to translate Facebook language to Nepal or others.This post entry is surely late in being published as Facebook has been in Nepali version (Nepali language translation) months back. After using Opera‘s latest version of web browser in Nepali language, Google’s Gmail in Hindi, even Google Chrome in Nepali, UsNepal.com though poorly Nepali indented, finally Facebook is the latest site I have been using in Nepali. 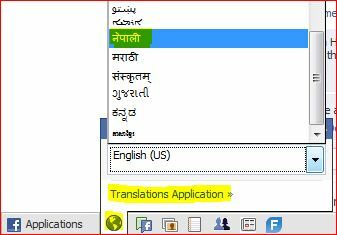 To begin your Facebook session in Nepali- find an option saying participate in Facebook’s language translation project in Translate Facebook button. Precisely saying, look at the Facebook toobar like menu (as shown in screenshot) and select the Translations icon, click and get participated. On the next step, you will see language selection drop down menu as shown above. Choose Nepali or any language you want to use Facebook in. I don’t think I have to write more about this. For more Facebook related articles, visit our archives section, tag: Facebook! XP to Windows 7 'Upgrade' Scheme Announced by Microsoft- How to upgrade to Windows 7 from XP?